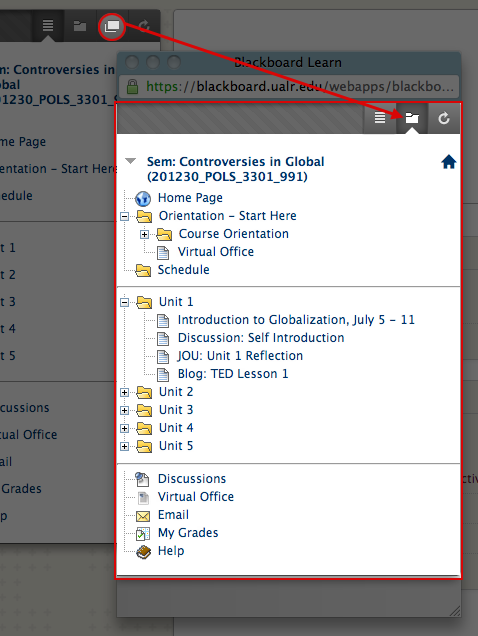 Within a Blackboard course, there are two types of navigation: navigating between links in the course menu and navigating within content areas like learning modules and folders. To navigate between course areas, click on the desired link in the Course Menu. As pictured here, to get to the “Unit 1” area, you would click on the “Unit 1” link on the Course Menu. 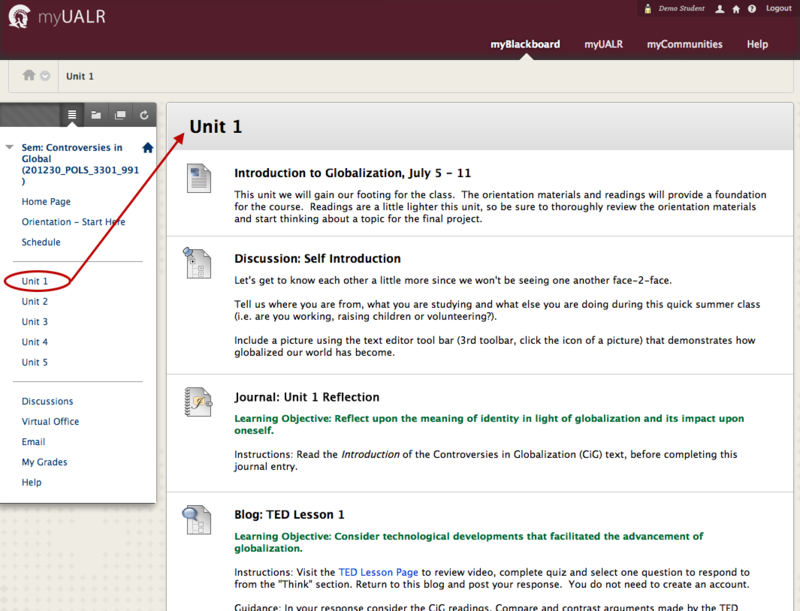 Use the Course Map to locate and then navigate to an item, folder, or area. Click on the name of the item, folder, or area to go to that location. Once you navigate to an item in the course using the course map, it will automatically change you course menu to Folder View. To change the course menu back, simply click List View in the course menu toolbar. At the top of the screen, right below the tab area is the Breadcrumb pane. This path of links is often referred to as a “breadcrumb trail”, or just “breadcrumbs” because they are an easy way for you to backtrack where you have been in the course. Breadcrumbs are links that appear at the top of the course area. Due to the dynamic nature of many of the pages within the course, we strongly recommend that you use the breadcrumb links instead of the browser’s Back and Forward buttons. 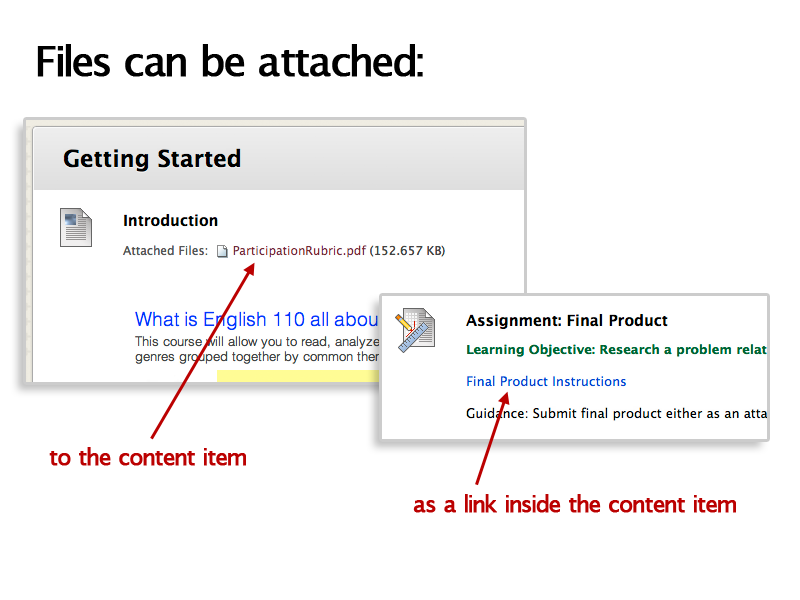 Breadcrumbs, like those in the image above, will appear at the top of each content area within a course. Clicking on a link will take you to that area of the course. For example, clicking Content in the breadcrumb trail will take you to the entry page of the section. Selecting the name of another link in the breadcrumb, in this case the Additional Information link, will take you to that page in the content area. Ellipses ( … ) indicate additional levels and they will fully display when you click them. Compare this image to the image above. Notice how you can backtrack through pages in the breadcrumb trail by clicking the page link. Your instructor may upload files to your Blackboard course for you to view or download. These files appear within the content as link text. Simply click the link to open or save the file. If you are unable to view a file, remember that you may need to download additional software or plug-ins to your computer to open the file. While browsing through your course materials and information, you may notice that the information has been organized in folders. Just as you can organize files on your computer in folders or put documents in folders within a file cabinet, instructors can organize content using folders in certain areas. You may even encounter folders within folders should your course contain quite a lot of material. To access information contained within folders, click on the folder title as pictured here. Don’t forget to use the breadcrumb trail to keep track of where you are in the course!